A temple in Phitsanuloke province is to hand out five I-Phone 6 smart phones to people who attend a major merit-making ceremony to be held during December 27-January 4. This market gimmick employed by WatRatburana to lure young people to get into the temple has become of heated debates in the social media. Phra Khru Sitthithamwipat, the abbot of the temple, said today that the smart phones distribution was a policy of the temple too lure Thai youths to return to the temple and to become interested in Buddhism. He believes that youths will be attracted to the smart phone handout and will turn out in force to attend the festivities to be held on the compound of the temple. 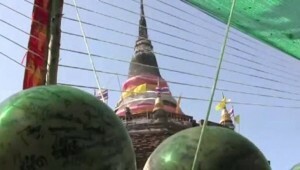 The monk said that just extending invitation for the youths to attend an event may not work. But distributing handouts such as smart phones might be an incentive to lure more people to attend the event.